How gorgeous are these girls?! They have grown up so much since being on The X Factor in 2011 and the girls have such a fantastic style! I absolutely LOVE their new single 'Move' and, unlike other artists that perform on The X Factor, they can actually sing (if you missed it you MUST watch it)!!! I especially love the bright purple picked by Perrie, isn't it fab!! These cost a tiny £2.99 each and I really like the different printed detail on each lid. I will do a full review with swatches and pictures this weekend. Have you seen or tried anything from the Little Mix range? Ahh this is so strange, I've just done a post on this range. I also <3 Little Mix. If you send me a message on FB I'll give you my contact to see whether the PR would offer you a go at this range. They look so cute don't they Sam! They look like fab choices made by the girls. I liked Little Mix from their X-Factor days too and am so glad to see how well they have done! I will have to try their make up range! Great lip colors indeed! 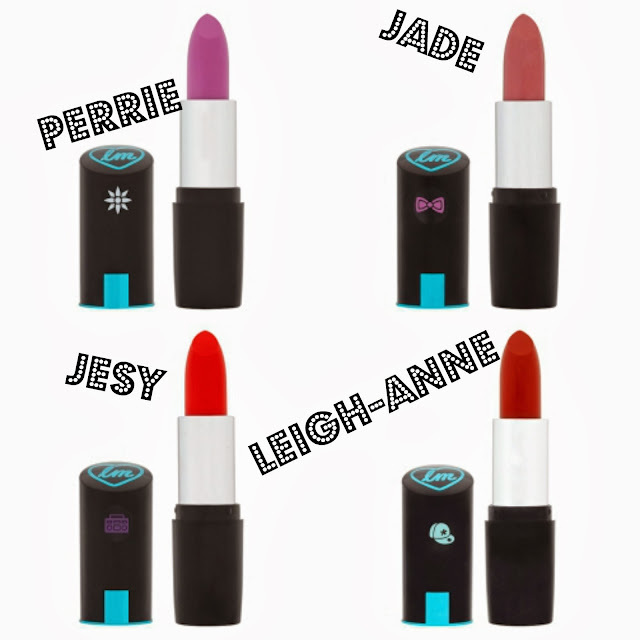 The jade one looks so pretty. Hope to see swatches of it so that I get to see them well.